Great news for former Horn [tag]Cory Redding[/tag] this weekend as he was traded along with a 5th round draft pick from the woeful (both team and city) Detroit Lions to the Seattle Seahawks for linebacker Julian Peterson. The trade sends Redding from a team with historically little talent to… a different team and any team is better than Detroit. Seattle struggled last year after making the playoffs in 2007, but with a healthy quarterback and playing in the NFC West they’re decades closer to being a playoff team. A defensive tackle the last three years in Detroit, Redding will play both inside and outside on the line in Seattle. It was a good week for Texas running backs and for the former Horns that play for the Tennessee Titans. This week’s group was led by Cedric Benson on offense and the continued dominance of Shaun Rogers on defense. [tag]Cedric Benson[/tag] – Benson had his first 100 yard game as a Bengal this week against the Jaguars. It looks like Cedric is playing motivated football since his return after being cut by the Bears for charges that were eventually dropped. Benson had 104 yards and a touchdown on 24 carries. [tag]Justin Blalock[/tag] – The Falcons keep winning and their offense keeps on putting up points. Atlanta beat up the Raiders in every phase of the game on Sunday. The offensive line play is allowing rookie quarterback Matt Ryan to have a big year. [tag]Jamaal Charles[/tag] – The rookie running back had his best game of his young career as he went over the century mark on the ground for the first time. Charles got his chance because Larry Johnson is still suspended by the team and backup Kolby Smith went down with an injury. The speedster didn’t disappoint gaining 106 yards on 18 carries. [tag]Leonard Davis[/tag] – The Cowboys keep stinking it up and a lot of it has to do with the play of the offensive line. Dallas has suffered injuries no doubt, but the running game is hurting and the quarterbacks have had no time to throw. [tag]Phil Dawson[/tag] – The best kicker in recent Longhorn history went two for two with a long of 52 yards in a Cleveland loss. [tag]Cedric Griffin[/tag] – Cedric Griffin had a decent day against the Texans recording four tackles. Houston struggled to get their offense going on the day as the secondary for the Vikings did a decent job. [tag]Michael Griffin[/tag] – The Tennessee Titans are the best team in football right now, and they’re led by a group of former Longhorns. Griffin is the current standout of those former Horns because of his steady play in the back of the Titan defense. Griffin had six tackles in the overtime win over the Packers. [tag]Ahmard Hall[/tag] – The Titan offense is not explosive in the passing game, but they get it done in the running game behind the lead blocking of the former Marine. Hall has become one of the premier true fullbacks in the NFL. He was even given a carry that he took for three yards. [tag]Casey Hampton[/tag] – Hampton had a big game in the middle Monday night in a win over the Redskins. The big man has struggled with injuries and did have to come out of the game on occasion. [tag]Michael Huff[/tag] – It wasn’t a good day for the Raiders or Michael Huff. The Falcons did whatever they wanted to do on Sunday through the air and on the ground. Huff finished with three tackles on the day. [tag]Derrick Johnson[/tag] – It was a slow day for DJ as he finished the game with only four tackles. It appeared the Chiefs were going to win a game, but as bad teams are knows to do they snatched defeat from the jaws of victory. [tag]Cory Redding[/tag] – The Lions are awful. They are the Los Angeles Clippers of the NFL. After controlling the game against the Bears they managed to give it away at the end. I feel so bad for Redding who finished with four tackles and a sack in the loss. [tag]Brian Robison[/tag] – Robison recorded two tackles in the win over the Texans. He continues to only get snaps when the starters need a break. [tag]Shaun Rogers[/tag] – Rogers is a monster. He has been dominating teams lately including nine tackles and a sack in the loss to Baltimore. Rogers will end up in Hawaii at the end of this season. [tag]Bo Scaife[/tag] – Another Longhorn on the only undefeated team in the NFL. Scaife has become one of the most consistent targets in the league finishing the game against the Packers with four receptions for 26 yards in a game where first downs were few and far between. [tag]David Thomas[/tag] – Thomas got the start against the Colts on Sunday night. He finished the game with three receptions for 29 yards in the loss. [tag]Ricky Williams[/tag] – The former Heisman winner finished with 16 yards for the third straight week. Ronnie Brown has become the clear go to back in Miami with Ricky getting touches when the Dolphins go to their “Wild Cat” formation. He has made an impact in the passing game as he made his third catch for over 20 yards in two games. [tag]Roy Williams[/tag] – Williams has not made the impact some thought he would coming to the Cowboys in a mid season trade. If anything the lack of production for Roy shows why there are so little trades made in pro football. In the loss, he caught one ball for 28 yards. [tag]Tarell Brown[/tag] – Tarell had a decent day at nickel back for the San Francisco 49ers. He ended the day with four tackles and no pass breakups. [tag]Cedric Benson[/tag] – Benson got his first start since he left the Chicago Bears. He had a solid day, carrying the ball 14 times for 52 yards. Benson recorded his first reception of the year but has failed to reach the end zone. The highlight of the day came when he blew up Steelers safety Troy Polamalu. [tag]Jamaal Charles[/tag] – With starting running back Larry Johnson “suspended” by his team Jamaal received more playing time but the rookie running back and his team failed to get anything going against the Titans. Charles finished with three carries for 17 yards and four receptions for 26. He may be the starter next week. [tag]Tim Crowder[/tag] – Crowder provided pressure that forced an interception by Matt Cassell on Monday Night Football, but his team got crushed on national TV. Crowder has yet to record any stats but continues to get snaps in a backup role. [tag]Leonard Davis[/tag] – The Cowboys are hitting rock bottom and the offensive line has had a lot to do with it. Tony Romo is out because of a pinkie injury he suffered because pressure had gotten to him. New quarterback Brad Johnson had little time to do anything in the loss to the Rams. [tag]Phil Dawson[/tag] – Dawson made one of the two field goals he attempted in the loss to the Redskins. He is nine for 11 on the season. [tag]Derrick Dockery[/tag] – Buffalo has become one of the better teams in the league because of a strong running game. Dockery is earning his huge contract with big play up front. [tag]Cedric Griffin[/tag] – It was a tough day for the Vikings defense. The group gave up 48 points in a loss to the Bears. Opposing teams continue to attack Griffin in order to avoid Antoine Winfield’s side of the field. Griffin had nine tackles and a pass breakup in the game. [tag]Michael Griffin[/tag] – Michael Griffin recorded seven tackles in his team’s destruction of the Chiefs. Griffin is becoming one of the better players on arguably the best defense in the league. It is only a matter of time before he is a Pro-Bowl type player. [tag]Ahmard Hall[/tag] – The Titans are one of the only teams left that use a true fullback and it is because of how well Hall has played. The tailbacks he leads the way for combined for over 300 yards in the game on Sunday. The Titans gave him a carry towards the end of the game which he got six yards on. 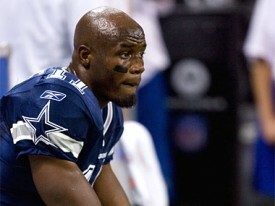 [tag]Michael Huff[/tag] – Huff had two tackles and two pass breakups in the overtime win over the Jets. The Raiders defense played much better this week than they did last week against the Saints. [tag]Quentin Jammer[/tag] – The Bills avoided Jammer’s side of the field for most of the day. Lee Evans did make an incredible catch over Jammer for a touchdown. After a rough start to his career, Jammer is becoming one of the better corners in the league. [tag]Derrick Johnson[/tag] – It was a bad day for D.J. and his defense. The Chiefs gave up over 300 yards rushing to the Titans. Johnson continues to struggle taking on blocks in the run game. He is great in space, but gets manhandled too often in the trenches. He finished the game with six tackles. [tag]Cory Redding[/tag] – Redding has been banged up all year, but is without question the leader for the Lion defensive front. That may not be a good thing. He recorded five tackles and a sack in the loss to the Texans. [tag]Shaun Rogers[/tag] – When Rogers is healthy and into the game there may not be a better player at defensive tackle. The big man had seven tackles and a sack in a defensively dominated game. [tag]Bo Scaife[/tag] – Scaife is still putting up numbers with Vince Young on the sideline as the backup. The Titans did not have to pass much in the blow out win but Scaife finished with three catches for 48 yards. [tag]David Thomas[/tag] – Thomas didn’t record any receptions but continues to get playing time as the second or third tight end and on special teams for the Patriots. [tag]Ricky Williams[/tag] – The Heisman Trophy winner had his least productive day of the year. He only carried the ball four times for 16 yards with no receptions. The Ravens did a great job stopping the run and it forced the Dolphins out of their game plan. Ronnie Brown is the clear number one in Miami. [tag]Roy Williams[/tag] – Roy Williams thought he was making a huge step up by being traded from the Lions to the Cowboys. Not so fast. The Cowboys played horrible and Roy never got involved in the game recording no catches. [tag]Tarell Brown[/tag] – Two tackles and an interception in the loss to the Chargers. 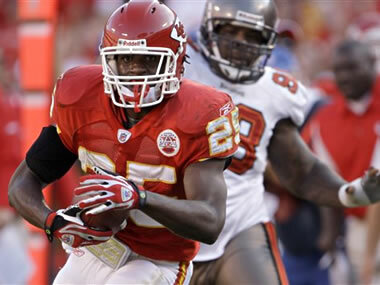 [tag]Jamaal Charles[/tag] – Seven carries for 38 yards rushing plus three catches for 24 yards. Jamaal also had his first NFL kickoff return for 21 yards. [tag]Phil Dawson[/tag] – 1/1 on field goals and on extra points. [tag]Jermichael Finley[/tag] – Finally saw the field for the Packers against the Cowboys but had no catches. He got in on special teams and managed to pick up an unsportsmanlike penalty in a brush with Martellus Bennett. [tag]Cedric Griffin[/tag] – Two tackles against Carolina. [tag]Michael Griffin[/tag] – Big game against the Texans with two interceptions. Also added two tackles. [tag]Ahmard Hall[/tag] – One carry for one yard. [tag]Casey Hampton[/tag] – No stats against Philly. Will miss the next game against Baltimore with an injured groin. [tag]Michael Huff[/tag] – Three tackles, two of them solos, against Buffalo. [tag]Quentin Jammer[/tag] – Recovered a fumble and returned it 23 yards, broke up two passes, and added three tackles in the Chargers blowout of the Fightin’ Brett Favres. [tag]Derrick Johnson[/tag] – One tackle in what may be one of 16 losses this season for the Chiefs. [tag]Cory Redding[/tag] – Two solo tackles for the lowly Lions against the 48ers. [tag]Shaun Rogers[/tag] – Had a solid game against Baltimore posting four tackles. [tag]Aaron Ross[/tag] – Five solo tackles, including one behind the line of scrimmage. [tag]Bo Scaife[/tag] – Three catches for 26 yards including a touchdown. [tag]Limas Sweed[/tag] – Still no playing time. [tag]David Thomas[/tag] – One catch for four yards in what will hopefully be one of many losses for the Patriots. [tag]Nathan Vasher[/tag] – Good performance for Nate versus Tampa Bay. Three passes defended including an interception, with four solo tackles added on. [tag]Ricky Williams[/tag] – Great game for Ricky and his counterpart Ronnie Brown as the Dolphins went back to the college game to get a little offensive firepower. He had 16 carries for 98 yards (6.1 average) and two catches for 21 more yards. [tag]Roy Williams[/tag] – Two catches for 18 yards in a loss to San Francisco. Roy has to be frustrated and already looking forward to 2009 somewhere other than Detroit. [tag]Selvin Young[/tag] – Very efficient game against New Orleans with 11 carries for 65 yards. [tag]Jamaal Charles[/tag] – Less busy after a good week one, only three carries for seven yards. The Chiefs only rushed the ball 19 times all game as a team. Charles also had a 15 yard catch and hurt Larry Johnson’s feelings. [tag]Phil Dawson[/tag] – Two of two on field goals with a long of 38 yards in a loss. [tag]Jermichael Finley[/tag] – Still looking for his first career catch. I’m not sure if he’s getting any snaps at all. [tag]Cedric Griffin[/tag] – Six tackles and one pass breakup against Peyton Manning and the Colts. [tag]Michael Griffin[/tag] – Picked up his first interception of the year off a tipped pass. Also added six tackles from his safety spot. [tag]Ahmard Hall[/tag] – Three carries for nine yards. [tag]Casey Hampton[/tag] – One tackle. [tag]Michael Huff[/tag] – Four tackles against KC and two passes defended. [tag]Quentin Jammer[/tag] – Posted 11 tackles and had a forced fumble in the Chargers’ controversial loss to the Broncos. [tag]Derrick Johnson[/tag] – Eight tackles, seven of them solo. [tag]Cullen Loeffler[/tag] – Inspired me to teach my kids to deep snap. [tag]Cory Redding[/tag] – Three solo tackles against the Packers. [tag]Shaun Rogers[/tag] – First sack of the 2008 season and added six tackles. [tag]Aaron Ross[/tag] – Four tackles. [tag]Bo Scaife[/tag] – Without Vince Young, just one catch for six yards. [tag]Limas Sweed[/tag] – Still no catches in his NFL career. Like Finley, looking at his game logs it appears he’s not even playing. [tag]David Thomas[/tag] – Picked up his first catch of the year against the Jets, a 14-yarder from Matt Cassel. [tag]Nathan Vasher[/tag] – Returned punts for the first time in a long while. Had three returns for a total of 21 yards. Added two tackles. [tag]Ricky Williams[/tag] – After an exciting preseason another ho hum game for Ricky. He had 11 rushes for 28 yards in the Dolphins’ blowout loss to Arizona. [tag]Roy Williams[/tag] – Just about the same performance as week one: three catches for 48 yards. Looks like Calvin Johnson has become the clear number one target in Detroit, maybe Roy can head down to Tennessee next year as a free agent. [tag]Selvin Young[/tag] – Was the Broncos’ leading rusher with eight carries for 78 yards, including a big 49-yarder. Also added one catch for eight yards.